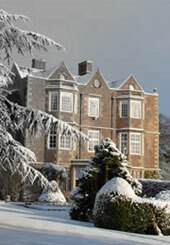 Goldsborough Hall is to Harrogate what the recent Viking hoard was to the British Museum: a wonderful hidden treasure. The original Hall with its rambling, multi-acre estates was built during some four-hundred years ago during the reign of Henry II and then rebuilt during the Tudor period when it became home to Princess Mary, aunt of Elizabeth II, the quintessential English Monarch. A lavish selection of suites, giant corner-rooms and delicious gourmet dining has ensured Goldsborough Hall a place in the hearts of thousands of honeymoon couples who find the four-poster beds, period oak panelling and walks in the glorious royal garden an irresistible combination. Awesome Jacobean Manor House in a rural setting just five miles from Harrogate City Centre. The hotel dates back to the early 1600s when it was the home of Sir Richard Hutton – the High Sheriff of Yorkshire. 11 acre estate features the award-winning Royal Gardens. Awarded 5 Gold Stars by the AA. Goldsborough Suites feature handmade mahogany beds and ivory Chesterfield sofas plus 50" Plasma TVs and walk-in showers. Stunning location for romantic breaks and honeymoons.